A festive assortment of ornaments from K&K Interiors. Stitched designs, with four different styles you can pick the perfect design for your tree this season. 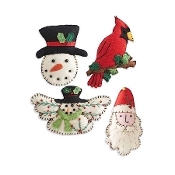 Designs include Cardinal, Dove, Santa, and Snowman. 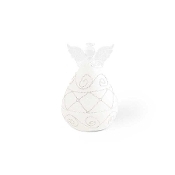 Lenox is America's leading tabletop and giftware brand. Lenox shares a passion for design and style with those who love to entertain and celebrate with family and friends. 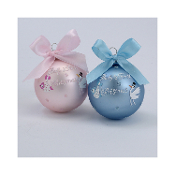 "Baby's first Christmas" Tree Ornaments The first holiday season with your newborn child is always a special one. 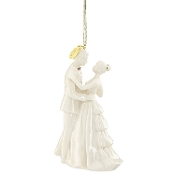 These ornaments from Kurt S Adler commemorate the first Christmas you spend with your child. Weather hes a crier, or a sleeper, make... 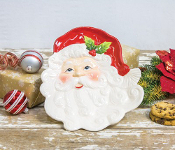 This fun and decorative Santa face plate may be the perfect place for your cookies on Christmas Eve! Colorful with a beautifully painted surface, it's sure to add style to your home during the holidays. The plate measures 11" in diameter. Adorn your home with this holiday accent. 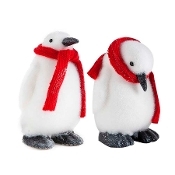 A cute fuzzy penguin to liven up your home this Christmas season. 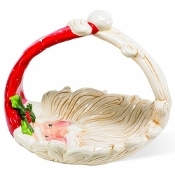 Decorate your home with your this classically styled Santa Claus. 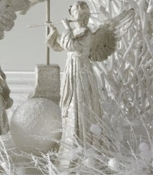 This beautiful and decorative white glitter angel holding a flute has amazing detail will add style to your home during the holidays. Add this cardinal throw pillow to your home decor as great focal point all winter long. 16 Inch Square Linen Pillow with Deer Motif with Holly Antlers 12"H x 18"W Frosted white angel with faux silver jewels LED light and handcrafted glass ornament or use as table decor. Packaged in gift box with tissue. Measures 5"H x 3"W. Includes batteries an ON /OFF Switch - Soft White Glow. A glass and glittery angel table ornament. Perfect for your seasonal Christmas decorating needs Angel with faux silver jewels LED light and handcrafted glass ornament or use as table decor. Packaged in gift box with tissue. 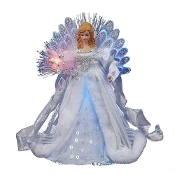 Measures 6"H x 3.5"W. Includes batteries an ON /OFF Switch - Soft White Glow. A glass and glittery angel table ornament. Perfect for your seasonal Christmas decorating needs Tinker Bell is surrounded by holiday lights in the delightful 2016 Disney's All Wrapped Up Tink Ornament. Away In A Manger Nativity Scene Lighted Artwork Baby's First Ornament, 2/Asst. From the mountains of North Carolina, manual WW weaves, sews, prints, and develops not just the fabrics, textiles, and beautiful products you'd expect from a Heritage company, they bring you the freshest designs for your home. 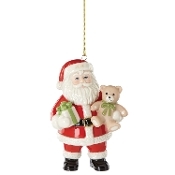 Celebrate your new borns first Christmas with this cute ornament from Giftcraft. A pair of snowman to commemorate your children. For every big and little combination of children. his Home Ornament. 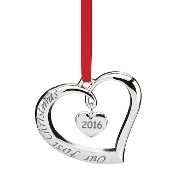 Crafted in shining silver plate, the ornament is a beautiful wreath, accented in green, with a tiny house inside, decorated with a red heart. Inscribed with the words "Bless This Home"
Blue and White Chapel in The Snow Fiber Optic LED Wall Hanging is crafted by Manual Woodworker and Weavers. This beautiful optic wall hanging is just one of several that you have the priviledge of adding to you Chrismas collection. Made in the USA. 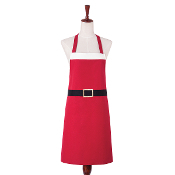 A cute cotton kitchen apron for this Holiday Season. Perfect for baking Santa's Christmas night cookies. A cute cotton kitchen apron for this Holiday Season. 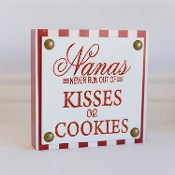 Perfect for baking Santa's Christmas night cookies This is home decor sign is a must for any Santa lover. It includes an image of Santa with a Merry Christmas salutation. Perfect for the holiday season. Keep your wine safe and snug on the way to that next fancy Christmas party this seasons with these cute fure trimmed wine bags. 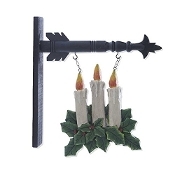 Decorate your K&K Interiors arrow with this candles sign. 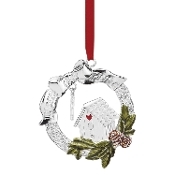 A cute dalmatian or kitty cat ornament for your Christmas decoration this season! Salt and Pepper shakers for you christmas dinner get-together. What goes together better than Santa and cookies? 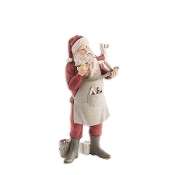 You can add a little more Christmas to you home this season with this 8" Ceramic Santa Claus Cookie Jar. Something he will surly enjoy when he stops in for gift drop off this year. Salt and Pepper shakers for you christmas dinner get-together. 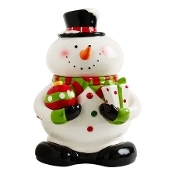 A beautiful painted ceramic snowman cookie jar. With included salt and pepper shakers in each arm. 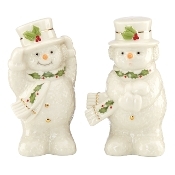 A cute set of two snowman figurines, dressed in classic holiday hats and colorful scarves. Christmas Block Saying Signs, 3-Designs Christmas Bottle with Greenery, 3 asst. Bring the jolly to your atmosphere this Christmas Season. Add on or all three of the designed signs: There's Room for Everyone on the Nice List, Treat Everyday Like Christmas, Let It Snow. Each Sold separately. The Christmas bottles with greenery will be a great addition to your home. Each has its own greeting. The Joy of Family. Joy to the World. Home for the Holidays. 3 x 3 x 6 inches. We carry products that include everything from traditional home decor, to religious and seasonal décor This camper is set in the middle of a forest during winter. Proving Home is Where the Heart is. If this is true for your family this wall art is just for your home. This beautiful lantern displaying a chapel during the Christmas season is sure to be a great addition to any rooms decor. 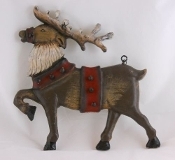 Standing Deer Design Christmas Figurine. Brown deer stands with Rabbit and Squirrel on its back. Christmas wreath detailing around Deer's neck. 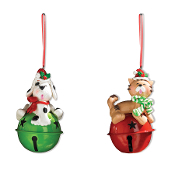 Christmas Dog Ornaments Available in 7 Breeds Polyresin Dog Design Christmas Ornament with Polyester String Hanger. Dog wears Christmas themed clothing. 7 Assorted Designs: Pug, Chocolate Lab, Dachshund, Golden Labrador, Yorkshire Terrier, German... Leave cookies out this Christmas with this matching plate and mug set. With snowman designs with a knit hat. 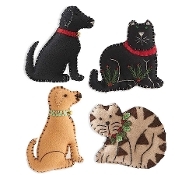 A cute assortment of felt dog and cat ornaments from K and K Interiors. Stitched designs, with four different styles you can pick the perfect design for your tree this season. 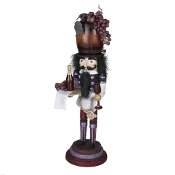 Decorate your home this Christmas season with these beautiful wine bottle stoppers from K&K Interiors. 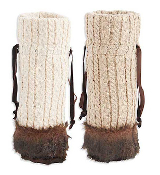 A pair of stockings that are the perfect size to hold a wine bottle. Each stocking comes in a snowman and Christmas Tree design. Give the gift that every wine lover really wants! This holiday season drink you beverage in this stages of man Christmas travel mug, includes top. Which will limit spills and keep your drink in the mug. It's sure to keep your thirst quenched. 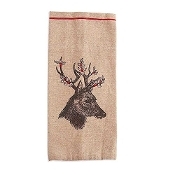 Keep your kitchen in season with these kitchen towels from Giftcraft. Comes in 4 different heartfelt designs and motifs This stunning lit Christmas Tree is sure to catch you guest eye. Replace your lamp with this LED canvas display. 19.5" x 1.5" x 13.5". 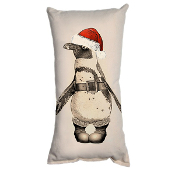 Add this Polyester Christmas Truck Design Pillow to your home decor this season. The pillow includes a Red truck and Christmas tree with red back. 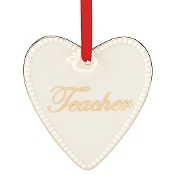 Make your child's first Christmas special with this celebration tree ornament. You have the option of boy in blue, or girl in pink. Sold separately. Fun and festive, the Countdown 'til Christmas 2-piece Cookies for Santa Set starts with a plate decorated with a gingerbread man and woman and lots of bright holly. 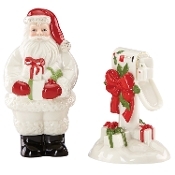 An elegant Santa and a package stuffed mailbox make up the Countdown 'til Christmas Salt & Pepper Set. 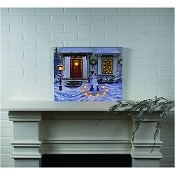 COUNTRY CHRISTMAS HOMECOMING Lighted Tapestry by Thomas Kinkade Customizable Recipe Book, 2/Asst. 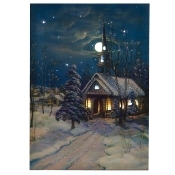 This Thomas Kinkade tapestry twinkles with joy as a family frolics in the snowy, holiday night. Beautiful detail and stunning fiber optics. Record all your own and heirloom recipes, and pass them down. A cute set of four snowman figurines from Transpac Imports. A perfect choice if you want to decorate your home this Christmas. 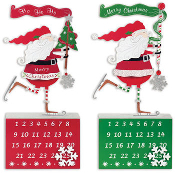 Decorate your home or office with this advent calendar from Sunset Vista Designs. Decorate your home or office with this advent calendar from Sunset Vista Designs. 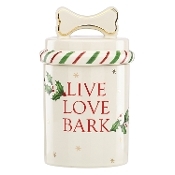 These ornaments are perfect for any pet lover. You can choose from a dog or cat hanging in a Christmas wreath or get both. 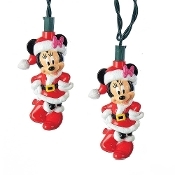 Ornament size: 3.75" x 1.75" x 4.5". Lenox is America's leading tabletop and giftware brand. Lenox shares a passion for design and style with those who love to entertain and celebrate with family and friends. Polyester Christmas Poinsettia design pillow. Red and green poinsettia with O HOLY NIGHT sheet music background. Polyester pillow with Candles with Holly Berries print design. LED lighted features. 2-AA batteries, not included. Polyester pillow with red candle and poinsettia print design. LED lighted features. 2-AA batteries, not included. 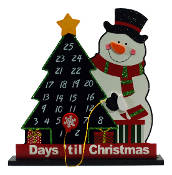 Stockings for Santa to fill with knik-knaks A large countdown to Christmas Frosty the Snowman wall Sign. Add some frosty to your lawn. A wooden frosty the snowman figure to add to your Christmas decoration collection Decorate your home this holiday season. With bright red and white design and a "Never Stop Believing In The Magic Of Christmas"
A cute assortment of Chalk Talk Christmas linens from Giftcraft. 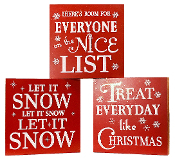 Choose from four different Christmas sentiment designs. Within each scented candle, a special piece of jewelry is waiting to be found. 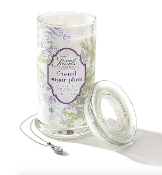 Enjoy the beauty and fragrance of your Soy Candle as it slowly reveals the treasure pouch. Continue to enjoy the aura of your candle for many more hours. 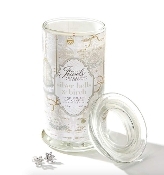 Within each scented candle, a special piece of jewelry is waiting to be found. Enjoy the beauty and fragrance of your Soy Candle as it slowly reveals the treasure pouch. Continue to enjoy the aura of your candle for many more hours. Enjoy seasoning your food with these festive Gingerbread men designed salt and pepper shakers. Made of ceramic. Approximate size: 2.25" x 1.25" x 3". 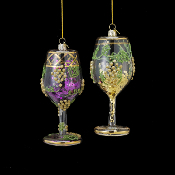 Painted Glass Wine Glass Deign Ornament with Grape Vine Design and Cork Charm Attachment. 3 Assorted Colors of Purple, Red, Green. Lenox is America's leading tabletop and giftware brand. Lenox shares a passion for design and style with those who love to entertain and celebrate with family and friends. Gorgeous portrayal of a country home on a snowy holiday night. 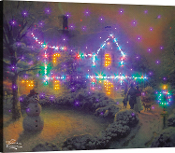 Artwork by Thomas Kinkade features beautiful detail and twinkling fiber optics. All I want for Christmas is someone else to cook! 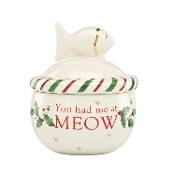 Give your feline family member their favorite treats from this fun and decorative jar. 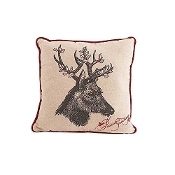 Decorate your home for the Holiday season with this throw pillow from Ganz. With snowman and Christmas is Love design. Made of Polyester Woven/Burlap Christmas is that time of year where you have to be around a bunch of people you might not even like or have anything in common, except blood relations. 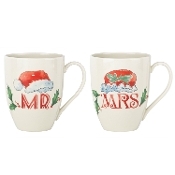 The holly and berries of the popular Holiday® dinnerware pattern decorate the Holiday Mr. & Mrs. 2-piece Mug Set along with a festive image of a Santa and Mrs. Claus hat. A wooden wall sign for your Christmas decorative needs. Femininely styled with a polka dot ruffle at the curved hem; embroidered design. 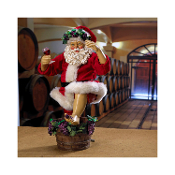 Part of Kurt Adler's Fabriche collection, this 11 inch Fabriche Beer Santa is a fun and festive addition to any holiday decor! 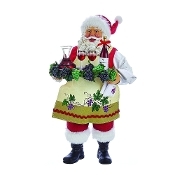 11" Fabriche' Santa Holding Tray of Wine is a fun and festive addition to any holiday décor. 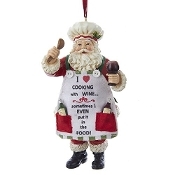 Santa says I love cooking with wine...sometimes I even put it in the food! 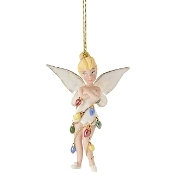 Top off your Christmas tree this year with this lovely Kurt Adler 12 inch Illuminated Angel. 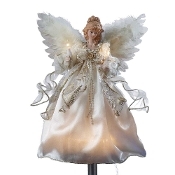 Top off your Christmas tree this year with this lovely Kurt Adler 12" White and Silver LED Fiber Optic Angel. 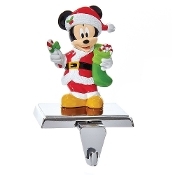 Hang up your favorite stocking this Christmas with this Mickey Mouse Stocking Holder from Kurt Adler!. 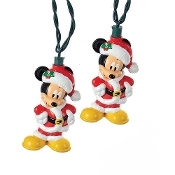 Kurt Adler Mickey Mouse Light Set // This UL 10-Light Mickey mouse light set from Kurt Adler is a fun and festive addition to any holiday decor! perfect for Disney fans, this lights set features light covers designed after Mickey... Large Glittery Santa or Snowman Lightup Wall Decor Decorate your home with these large metal sculptures from Hanna's Handiworks Size: 13”W x 20”H x 1½”D Made of Metal and embellished with glitter Requires 3AA batteries; not included. 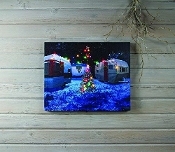 Christmas design polyester canvas print over MDF frame with LED lighted features and timer function. Motif features a red barn in the winter as snow falls. 2-AA batteries, not included. 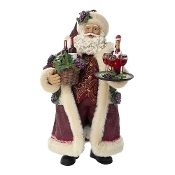 Santa and Snowman design decor with LED lighted candle inside. White with red, green, and black detailing. LED lighted feature. 2-AA batteries, not included. LED lighted polyester pillow. Design depicts Santa checking his list. LED lighted features. 2-AA batteries, not included. Polypropylene cotton filling. 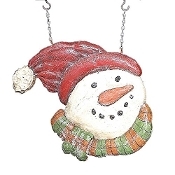 Snowman design shatterproof garland with LED lighted features. White snowman heads with red Santa hats. LED lighted features. 2-AA batteries, not included. Plastic. Charming LED Lighted Snowman Santa poly resin Figurine. Pom-pom on cap lights up. 4 Assorted Designs. 2 Sitting Snowman. 1 Snowman holding tree. 1 Snowman holding bell. Canvas and polyester fiber optic print with MDF frame and wire hanger. Timer function feature. Depicts a classic red truck on a white snowy background with green detailing. Fiber optic lighting features. 2-AA batteries, not included. Decorative Polyester Christmas Pillow with Snowman and Cabin design. LED Lighted features. 2 AA batteries, not included. Canvas and polyester fiber optic print with MDF frame and wire hanger. Features Timer function feature. Depicts cozy looking house in a snowy landscape. Silver and blue detailing. Fiber optic lighting features. 2-AA batteries, not included. LED Wreath with Merry Christmas Sign The LED lighted sign would be a great addition to any room this Christmas Season. The Wreath and Merry Christmas image is 20 x 16 x 4 inches. Get yours today! Bullet Point Bullet Point Bullet Point Bullet Point A set of three stemless wine glasses. Reads: "Pop, Pour, Clink and Drink", "It's the most wonderful wine of the year", "Eat, Drink and make Merry"
This coming holiday season add these festive signs to your home decor. Please Snow I'm A Teacher. Sign is made from wood. A cute lighted christmas tree camp. Little Bit Of Heaven Christmas Metal Wall Plaque MDF Chalkboard Design Desk Block, 5/Asst. Committed to delivering their quality hand-crafted products to clients all over the nation, Adams and Co carries products that include everything from traditional home decor, to religious and seasonal decor that will give your home that one-of-a-kind feel and welcoming appearance. 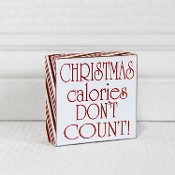 Christmas sentiment desk block chalkboard novelty signs. MDF and Paper Christmas wall plaque. White, gold, and blue detailing. 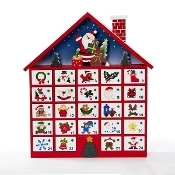 Countdown to christmas with this advent calendar from Giftcraft! A decorative novelty sign wall plaque from Giftcraft. A metal advent calendar from Giftcraft. Mistletoe Kiss Secret Jewels Martini Candle! 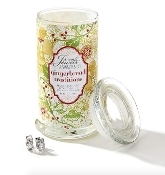 This 5.6 oz Martini Glass Candle contains a stunning Cocktail Ring waiting to be found. Set of 2 ceramic mugs for him and her. Mr and Mrs Grouch Live Here. 6 x 6 x 6 inches. 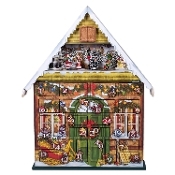 MusicBox Kingdom Advent Calendar Decorative Box // Music box Kingdom 45075 - Advent Calendar Made Of Wood. If One Of The 24 Doors Is Opened The Melody "We Wish You A Merry Christmas" Is Played, The Scene Underneath The Beak... We carry products that include everything from traditional home decor, to religious and seasonal decor. Each is designed to give your home that one-of-a-kind feel and welcoming appearance. 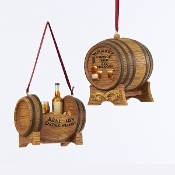 A perpetual Christmas calendar Who doesn’t love drinking wine! Polyester Plush Christmas Fox Design Shelf Sitter with red and grey accents. Fox wearing stocking cap. 2 Assorted Designs: Boy, Girl. 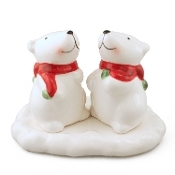 Shake on a little Holiday cheer with this adorable pair of polar bear salt and pepper shakers. The set is made of white dolomite ceramic with a lovely glossy glaze. The Polar Bear couple feature happy smiles, rosy cheeks and cute scarf detailing. Set includes a "snow bank" tray for storage. Do you like to spend Christmas in the great outdoors? Maybe you have a certain affinity for camping. Either way, this is a small camper ornament for your Christmas tree. Do you like to spend Christmas in the great outdoors? Maybe you have a certain affinity for camping. Either way, this is a small camper ornament for your Christmas tree. Friends Forever, You had me at woof. Purrfect Kitty, You had me a meow. Decorate your tree with these Polyresin Pig in Santa Hat Design Ornament with Copper Finish Metal Bell Detailing for many holiday seasons to come. 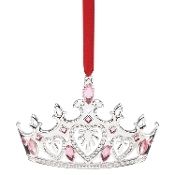 The perfect decoration for your little princess, the Princess Crown Ornament will add sparkle and a royal shimmer to your holiday tree. Display your beautifully decorated Christmas sugar cookie for your next holiday party! A cute set of Santa Claus Coffee Mugs. Hand painted and made from dolomite. A quite jolly set of coffee mugs. Santa Claus is coming to town. Display a portrait of Ol' Saint Nicholas with bright LED accents. Keep those cookies nice and warm with the hot coffee in a Christmas themed mug. What better way to store your homemade cookies and treats than in this Santa Cookie Jar? Jar is made of ceramic. Approximate size: 7.5" x 7.5" x 13". 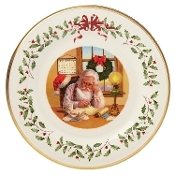 Serve your meals or even hors d'oeuvres this Christmas on Santa shaped plates. Made of ceramic. Approximate size: 9" x .2" x 9". What better way to warm up than with a hot beverage in the Santa mug. This mug is 4.5 in x 5 in. Enjoy coffee and tea this holiday season with this sugar and creamer set. Each is disguised as a gift bag or the face of Saint Nic. 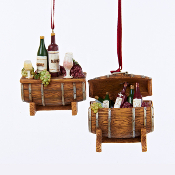 Give the gift of wine this season with this wine bottle bag from Giftcraft. If rocking into the Christmas spirit is on your to do list, look no further. 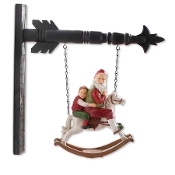 This Santa rocking horse arrow should do the trick. It includes Santa and a child on a rocking horse. 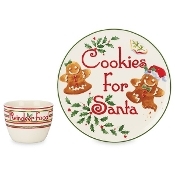 Greet Santa with cookies out of this Santa and sleigh cookie jar. The jar is useful for storage and appeasing the eye. The jar is made out of ceramic and is 10" x 11" x 6.5". Add a Holly Jolly Santa or a Frosty Snowman to your yard the is Holiday Season! Each sold, separately. Approximate size: 18"W x 23.5"-25"H.
Santa Pillow with LED Lights Polyester Christmas design pillow with LED lighted features. Santa in a snowy landscape. Green and red detailing. LED lighted features. 2-AA batteries, not included. Bullet Point Bullet Point Bullet Point Bullet Point Enjoy the Christmas Season with a little bit of Santa seasoning with these salt and pepper shakers. Made of ceramic. Approximate size: 2.5" x 2.5” x 3.25”. Santa Trio Dip Holder What better way than to display dips and salsas at your Christmas party than with this Santa trio Holder. Made of ceramic. Approximate size: 8.75" x 8.75" x 4.25". Trio dip holder. Made of ceramic. Approximate size: 8.75" x 8.75" x 4.25". Santa painting a toy train and entertaining a child statue. An image you and your children will enjoy seeing. Excitement is sure to build up every time the statue is seen. Polyresin Santa Design figurine. Santa wears a red suit with a plastic silver present under his arm. Santa always reads his naughty list. Make sure your kids know it! Brighten your Winter with Lit Snowman canvas. Sayings include: Happy Holiday, Joy to the World, and Merry Christmas. Set of 3. All Scottie will surely love to add these Black Scottie Dog Design Ornaments with Red Ribbon Hangers to there tree. Hand screen printed decorative pillow with polyester fiber fill. 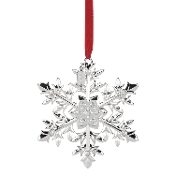 Screen printed and sewn in Bucks County, PA. Add shimmer and sparkle to your holiday tree with the 2016 Snow Majesty Snowflake Ornament. 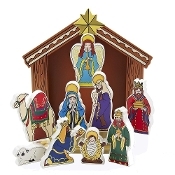 Mark the days until Christmas with this wooden advent calendar. With Frosty and a Christmas tree, count down until that holy night From the mountains of North Carolina, manual WW weaves, sews, prints, and develops not just the fabrics, textiles, and beautiful products you'd expect from a Heritage company, they bring you the freshest designs for your home. Snowman Block Plaques, 3 Designs Snowman Dish Hat Head Scarf Body Ceramic 4 Pc 14"
This coming holiday season add these festive signs to your home decor. Signs sayings include: Christmas Warms the Heart with Love, Friends Make Winter Warmer, and Christmas is the Most Wonderful Time of the Year. Signs are made from wood. 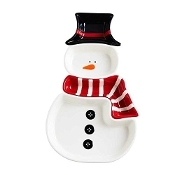 Snowman Ceramic 4 Piece Dish - The snowman includes the hat, head, scarf, and body. The item is 14 x 8 x 2" New with tags. 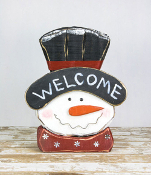 Brand New - Glitter Snowman Face - made from carved wood, painted and covered with glitter. 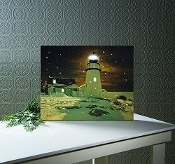 Canvas and polyester print with LED lighted features in MDF frame with wire hanger. Includes Timer function feature. Design features an old fashioned black bicycle with a red lantern in the snow. Brown background. LED Lighted features. 2-AA batteries, not included. This beautiful lantern displays a jolly St. Nick who ready to lighten your room during this exciting Christmas season. Kurt Adler specializes in beautifully detailed Christmas Ornaments and holiday seasonal decor designed exclusively with your needs in mind! 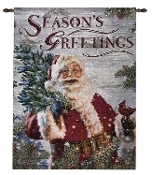 This Christmas decorate with a Wall Hanging-All Aboard For Christmas-Fiber Optic Tapestry or gift a friend. 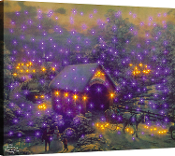 Sunrise Chapel by Thomas Kinkade, remote control fiber optic tapestry wall hanging features a beautiful winter scene, the entrancing sparkling glow brings the holiday spirit into the home. From the mountains of North Carolina, manual WW weaves, sews, prints, and develops not just the fabrics, textiles, and beautiful products you'd expect from a Heritage company, they bring you the freshest designs for your home. Greet friends and family this Winter with this Snowman that will surely bring cheer. Design out of wood. Approximately: 15" x 4.5"x 18". 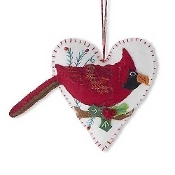 These lovely cardinal decorations are sure to be great addition to any tree. A white heart with a red cardinal. 5.5" x 4.5" x 2.75". 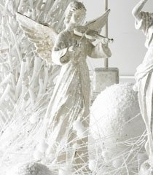 This beautiful and decorative white glitter angel holding a violin has amazing detail will add style to your home during the holidays. 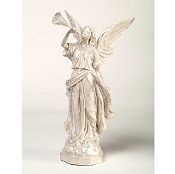 Decorate your home with this beautiful 16 inches H x 8 inches W glittery angel from K and K Interiors. A set of three stemless wine glasses. The Winter Birch Santa Fiber Optic Latern is a welcoming addition to any Christmas collection. It is large spaning 15.5" high by 7.5" wide by 7.5" deep. Illuminate your home with the splendor of fiber optics this Christmas. Made in the USA. 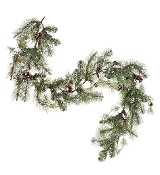 Red, Green And White " Winter Birch Santa " Fiber Optic Wall Hanging is crafted by Manual Woodworker and Weavers. This beautiful optic wall hanging is just one of several that you have the priviledge of adding to you Chrismas collection. Made in the USA. From the mountains of North Carolina, manual WW weaves, sews, prints, and develops not just the fabrics, textiles, and beautiful products you'd expect from a Heritage company, they bring you the freshest designs for your home. 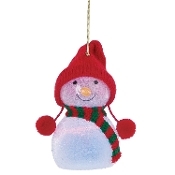 Glowing and smiling, the Wonderball Snowman in Red Knit Hat Lighted Ornament is a perfect addition to your holiday tree. 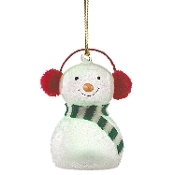 Glowing and smiling, the Wonderball Snowman in Red Knit Muffs Lighted Ornament is a perfect addition to your holiday tree. 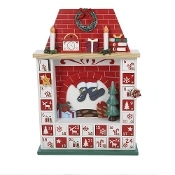 Count down the days until Christmas throughout the Advent season with this 15 inch wooden Advent calendar by Kurt Adler. Ceramic New Baby Sibling Owls Ornaments A cute assortment of baby and parent owls. Purple and Blue owls are hanging from your Christmas tree this season. Owls are cute, and your newborn is just as cute as you. Size 4.25" Choice of 4 different colors Celebrate your baby's first Christmas! A cute set of novelty tea towels from Giftcraft. 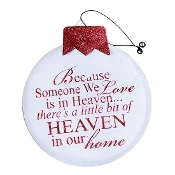 Made from Cotton and printed with cute Christmas sentiments. Giftcraft Christmas Lighted Wall Art Christmas is almost here, and Giftcraft has the artwork to decorate your home this season. These plaques light up and are adorned with sentiments. One reads: "May your Christmas be merry & bright." or "Believe... Giftcraft Christmas Season Kitchen Serving Tray Giftcraft has come back this season with a serving tray in red and green colors in a classic Santa Claus pattern. Tray reads "Believe in the magic of the season" Size: 12" x 16"
Giftcraft Fabric Fiber Doormat, Santa Please Stop Here Polyester fiber doormat with rubber backing. With Red, green and white candy cane stripes. Reads: "Santa, Please stop here" Size: 30" x 18" Rubber Backed Polyester Giftcraft LED Lighted Chalkboard Advent Calendar Light up Christmas wall decoration. Count down the days until Santa slips down that chimney to eat your cookies, drink your milk and leave the presents. 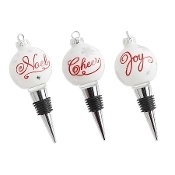 Size: 7.5" x 1" x 9.5"
Giftcraft Wine Glass Christmas Tree Ornaments These glass ornaments from Giftcraft come to you this Christmas season with hand-painted decoration and their own little wine and Christmas themed sayings. Order one today as a little Christmas... Giftcraft, The Legend of Santa Claus Wall Plaque The vintage inspired design of the holiday wall plaque shares the legend of Santa Claus. 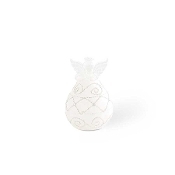 A cute and informative christmas decoration to place anywhere around the home! 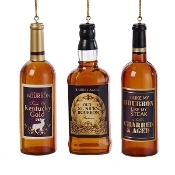 Size: 13.8" x 11.8"
Kurt Adler Bourbon Bottle Ornament Set Set of 3 18 Year old bourbon, taste of Kentucky Gold Barrel Aged Old St. Nick's Bourbon I like my Bourbon like my steak, a little charred and aged Size: 4.25"
Mini Christmas Holy Night Starter Set. 7pc set. 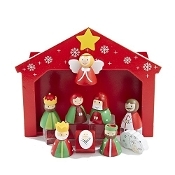 Mini Christmas North Pole Starter 7pc set. 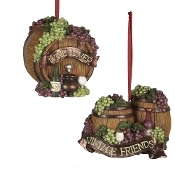 This wine themed Christmas ornament is perfect for adding a charming touch to a gift or as a decoration on your tree. 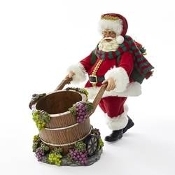 The Santa ornament shows Santa holding a bottle of wine in one hand, a wine glass in the other, has wine grapes in his hand and wine barrel surrounded by grapes. Snowy Park, Christmas Artwork, 2 Assorted Winter is here, and what a wonderful wonderland it can be. You may not have a White Christmas this year, but you can make sure your home has the feeling of a white Christmas. These two prints from... Stretched Canvas Lighted Snowman Wall Art An assortment of LED lighted stretched canvas wall prints from Giftcraft. The perfect Christmas decoration for this holiday season. 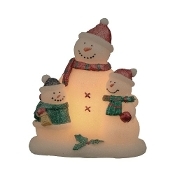 Battery powered Size: 9.1" x 12.4" x 0.8"
Wonderful Winter Sculpted Snowman Family Flameless Candle6 Tis the Season to light up your home with our sculpted Winter Wonderland Trio. Each candle portrays a charming snowman family crafted in wax, is hand painted and finished with glitter... 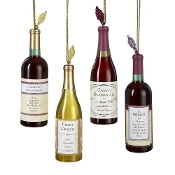 Fabric Snowman Wine Bottle Ornaments, Set of 3 // These festive wine bottle ornaments are a great way to make your next Christmas party a smash hit, includes 3 different polyester and metal snowman designs. Three different styles of snowmen Size: 6"
Holiday Themed Stiletto Wine Bottle Holder Riverland Christmas LED lighted Canvas Wall Print. Display your favorite bottle of wine at Christmas time in this fashionable high heel bottle holder. Show off your love of fun and good wine this Christmas with one of these decorative wine glasses. Four unique phrases and designs to choose from. Decorating for Christmas? Why not decorate your wine bottles too! 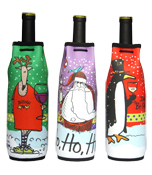 Dress up your wine for the holidays with a fun and seasonal Santa Claus wine bottle outfit bag. 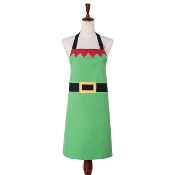 Dear Santa, Everything I Want is…Apron has a playful attitude. Enjoy giving or wearing one of these fun, colorful cotton aprons with a little attitude. Aprons come in several different sayings and color combination by Wild Hare Designs Wild Hare Designs Apron - Friends are the Best Presents has a playful attitude. 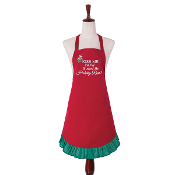 Enjoy giving or wearing one of these fun, colorful cotton aprons with a little attitude. 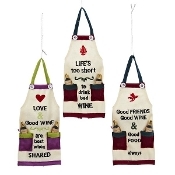 Aprons come in several different sayings and color combinations. A cute hanging chalkboard calendar from Giftcraft. Make sure your little one knows how many days until Santa Clause comes!